Neither the City of Arvada nor the Regional Transportation District (RTD) installs or maintains bus benches at most bus stops. Installation and maintenance of bus benches is handled by Creative Outdoor Advertising of America Inc.
We want to ensure your requests are responded to in a timely manner. If you wish to report an issue related to bus benches, please contact Creative Outdoor at 1-800-661-6088 or Operations@Creativeoutdoor.com. 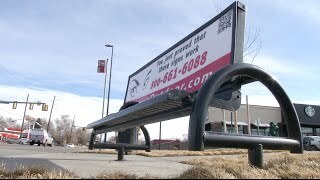 In 2014, the company providing the benches in Arvada ceased being in the bus bench business and removed 153 bus benches from stops throughout the community. City Manager Mark Deven looked for a solution. “We do not want to get into the bus bench business, but we are concerned for bus patrons, particularly the elderly or disabled." As an interim solution, the City installed old park benches at some of the community’s stops, while reaching out to the private sector to identify a new company to provide the service. In 2015, the Arvada City Council approved an agreement with Creative Outdoor Advertising of America Inc. for the installation and maintenance of bus benches. For information on Creative Outdoor visit www.CreativeOutdoor.com.